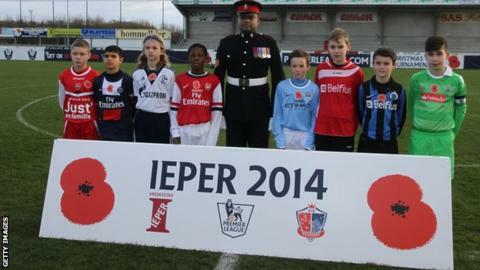 The Premier League has postponed its annual Truce Tournament in Ypres, Belgium over safety concerns. Organisers called off the under-12s event commemorating those killed in World War One after Belgium raised its terror alert after the Paris attacks on 13 November, in which more than 130 people died. It was planned for December 10-13. Clubs from France, Germany, Belgium and England have sent teams to compete in each of the past four years. A Premier League spokesman said the decision followed consultation with clubs, the Foreign & Commonwealth Office and Belgian authorities. Ged Roddy, the Premier League's director of youth, said: "We are disappointed to postpone the Truce Tournament as it has been extremely beneficial to the development of the young players who have taken part in previous years. "But the safety of those due to be involved is our first priority."